Are you ready to face what awaits deep in the woods — and beyond the boundary between life and death? 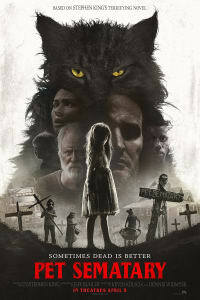 In PET SEMATARY, opening on April 5, a family haunted by tragedy learns that sometimes, dead is better. Life seems good for the Creed family as they relocate from Boston to a small town in Maine. A pet burial ground near their new home seems like a quaint relic of old-fashioned rural life. Unfortunately for the entire family, that not-quite-hallowed ground is an omen of terrible things to come. The Creed clan will face untold horrors before their story is done. The film’s scenario is scary enough, but directors Dennis Widmyer and Kevin Kölsch have recruited an incredible cast to bring the story to life. Here’s the great cast of PET SEMATARY. Jason Clarke leads the cast as Louis Creed. He’s a doctor and a family man, whose new job in Maine offers a chance for the family to enjoy life at a slower pace than they had in the city. Intrigued by the nearby pet cemetery, and by the hidden burial ground in the woods behind it, Louis is pulled into a series of dark actions that will change his life forever — if they don’t simply end it. The Australian actor is a veteran of television and film, and his brooding intensity makes Clarke a particularly good choice for men with a vicious streak. He’s best known for ZERO DARK THIRTY, DAWN OF THE PLANET OF THE APES, CHAPPAQUIDDICK and FIRST MAN. 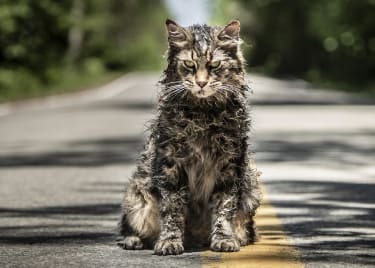 PET SEMATARY is Clarke’s third film in 2019, as he also plays lead roles in SERENITY and THE AFTERMATH. Amy Seimetz plays Rachel Creed, the wife of Louis and the mother of two young children. Rachel must deal with the consequences of her husband’s risky actions, even as she is haunted by experiences in her own past. Seimetz is a jack-of-all-trades — she acts, directs, writes and produces. She starred in AMC’s “The Killing” and co-created the Starz series “The Girlfriend Experience.” Her recent film credits include ALIEN: COVENANT, LEAN ON PETE, MY DAYS OF MERCY and WILD NIGHTS WITH EMILY. PET SEMATARY would be nothing without lifelong Maine resident Jud Crandall, the elderly neighbor who introduces the Creed family to some of the more quirky aspects of life in their new home. John Lithgow is the perfect choice to play Jud, whose knowledge of local history — and the uglier side of small-town life — adds depth to the freaky tale. Lithgow is a celebrated actor, comedian, author and singer who has done just about everything in entertainment, but he’s not done yet. He’s best known for his award-winning performances on “3rd Rock From the Sun,” “Dexter” and, most recently, “The Crown.” His notable work in film includes TERMS OF ENDEARMENT, HARRY AND THE HENDERSONS, SHREK, RISE OF THE PLANET OF THE APES and INTERSTELLAR. 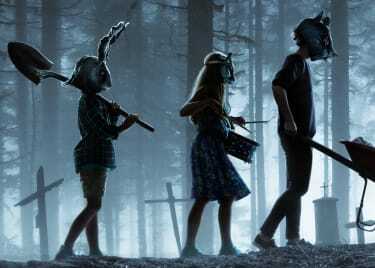 PET SEMATARY also relies on performances from young actors who do far more than round out the supporting cast. Jeté Laurence plays Louis and Rachel’s daughter, Ellie Creed, while twins Hugo and Lucas Lavoie portray Ellie’s younger brother, the toddler Gage. There’s one more important player: Obssa Ahmed appears as Victor Pascow, who in the novel is Louis’s first patient in his new position at a university in Maine. He becomes a connection between Louis and a mysterious supernatural world. And of course, there can’t be a PET SEMATARY without Church the cat, who plays an integral role in the movie’s evil mystery.